Cast: Michael Angarano, Kurt Russell, Kelly Preston, Danielle Panabaker, Mary Elizabeth Winstead, Lynda Carter, Kevin Heffernan. Story: The son of two superheroes starts at superhero school. 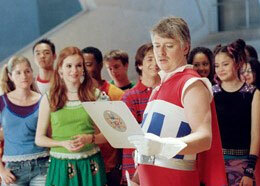 Sky High is a schizophrenic cross between The Incredibles and X-Men, aimed at kids. After a terrific opening, it slides into mediocrity long before the final reel and averages out as merely reasonable. What a shame. Sky High had teen crap written all over it, so I was blown away by how sharp and funny the first half was. Fantastic supporting performances from Kevin Heffernan (Super Troopers, Dukes of Hazzard) and "mad science" teacher Kevin McDonald help to bring the hilarious dark script to life. These two guys give the movie a nice quirky humour and are ably assisted by the smaller roles such as "All-American Boy" Dave Foley and Cloris Leachman as the school nurse who looks spookily like Lloyd Bridges. Unfortunately, once the scene has been set and we get down to the full-blown plot development, things fall apart rather badly. The jokes all but disappear and the screenplay collapses into a by-the-numbers predictable teenage high school crapfest. With supervillains trying to destroy the school. Michael Angarano plays young Will Stronghold and rarely disappoints, though there's nothing particularly memorable about his performance. Kurt Russell and Kelly Preston are pretty good as young Will's superhero parents, but the real quality is in the small adult parts - there's real star quality in there, if you look past the actual stars. Amongst the kids, no-one is a stand-out success, with the notable exception of relative newcomer Nicholas Braun (the glowing kid) who adds a very promising zing to an otherwise shallow character - and ex-Wonder Woman Lynda Carter is an inspired piece of casting for the school principal. It's such a disappointment that the fabulous first half had to be abandoned to make way for the corporately correct nonsense that follows. However, if you like high school tosh then this is probably the perfect movie for you. The half-term brigade should love it. Sky High is a brave attempt at a crossover between high school and proper comedy, but the bean-counters won over in the end and spoiled what should have been a straight 5/5 movie. When will they learn? To enjoy this film you should be: asleep during the second half. Sky High is released in the UK on 21st October. Sky High ... It's a Disney picture so that should help with the initial analysis. However, although the film is funny and does have a few novality moments; for example (Lynda Carter as Principle Power saying "Who do you think I am? Wonder Woman? "), secret caves and bat-poles and character names out of Tolstoy coupled with real people playing 'The Incredibles'. The film has Disney written all over it as it has comedy action and drama in pretty much even amounts. I like Disney and this film soon had me in it's trap and yes it had the same old Disney message; being popular won't last, but true love and friendship last forever. Escape for a couple of hours, especially over half term and the whole family will enjoy it ... don't question .. enjoy! !